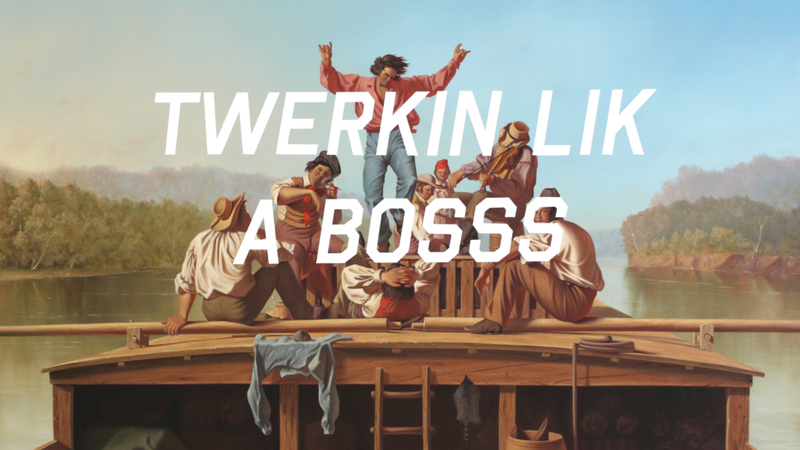 We caught up with Shawn Huckins for some insight into his clever work. 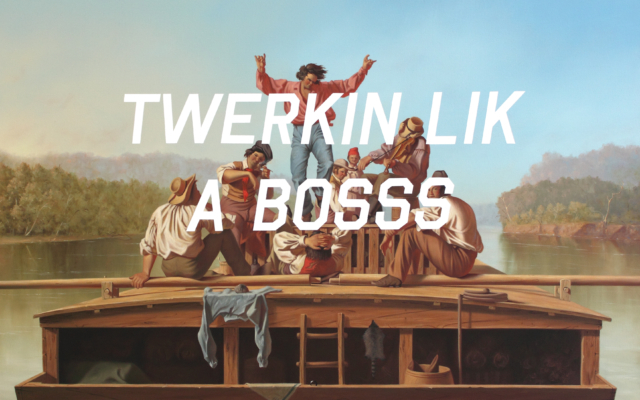 Artist Shawn Huckins is fascinated by the evolution of human communication. His paintings depict this timeline of evolution, brought on by the immediacy of technology, in a way that will truly make you laugh. We caught up with Shawn for some insight into his clever work. How and when did your creative life begin? It was at a young age in elementary school. I sat with an unknown kid on the bus ride home one day, and he was drawing in his sketch books. It fascinated me so much that I asked my mom that night if I could get my own sketch books. I drew whatever interested me at the time. To a second grader, it was sports heroes, cartoon characters, and my favorite toys. In 1993, my grandmother passed away and I was given her slightly used oil painting set. I was age nine at the time. I remember how frustrated I was with the medium since I had no idea how to manipulate the buttery paint. I did a small barn painting and put the kit away and went back to drawing in my sketch books. I didn’t seriously take on painting again until my college years. I had some good professors that reintroduced me back to painting and I haven’t turned back. Could you explain the overarching message you hope to communicate through the contrasting text and imagery of your work? I want to convey, in a humorous way, the stark difference our method of communication has evolved over the centuries. It seems like our country’s founding years were more civil, cordial, and more intelligent compared to our fast paced, technology driven society. We may be able to communicate instantly, but has the quality of that communication suffered as a result of advancing technology? Do you typically find a phrase that inspires you first, and then find an image to go with it? Or is it the other way around? It usually starts with an image. But, at the very beginning of the process, I will research images separately and then research text separately. Once I have my list of possible text phrases to use, I will pull the image I want to work with and see what phrase works best. Where do you source the inspiration for the imagery within your paintings? My images are sourced from public domain records from the 18/19th centuries. Typically, art museum websites will offer high-resolution image downloads free of charge. Sometimes not and I’ve created large paintings based on a little pixelated thumbnail. I have also gone to museums myself and have taken my own photos of classic American paintings. What are some of the challenges that arise in your process? The constant struggle within my work is the main focus – the face. It’s very easy to make the face not look correct or the flesh color to look ‘plasticky.’ Also, if one thing is off, say a highlight on an eye, it can throw off the entire portrait. I wasn’t formally trained in portraiture, so I have days where I feel like I don’t know what I’m doing and get discouraged when I view some incredible portrait painters. Portrait painting is entirely self-taught on my end. Do you have a favorite piece of yours? I remember, too, where the text came from. It was a picture of Justin Bieber where he’s wearing his jeans basically down to his knees and his entire underwear is showing. I guess the cool kids wear them like that… Anyways, someone in the comments section wrote that, basically, because he [Justin] has swag, he can wear his pants that way. My current source of inspiration are antique stores. An artist can find a lot of material to work with at such a store. My new series of paintings deal with high-density housing and its effect on the environment. I love finding old National Geographic magazines or old books to help arrange my landscapes in these new paintings. If you could go back in time to when you first began creating art, and offer yourself one piece of advice, what would that be? You’re going to make a lot of mistakes and make a lot of bad paintings. Just keep painting. No one is going to hand you success. You have to work and work hard for it. I read that in a magazine some time ago. Check out Shawn’s website to see more of his work and stay updated with his upcoming shows.